The surgeon's visual area has increased, easing the performance of tasks such as the fixing of the Double fixation forceps at the peri-limbic conjunctivae. Diameter increase plus reduction of "neck" size allowing the new Tunnel maker to operate under more than double the previous brightening model. The force used at the stromal tunnel making was amplified by the increase in the manipulation cylinder diameter. With a larger diameter cylinder, each movement the surgeon's hand makes causes a less range displacement in the curved spatula, allowing course corrections anytime. Control is also eased due to the Manipulation Cylinder operation closer to the eye. The 57% weight reduction was achieved specially by reducing the "neck" size and using titanium as raw material. Titanium provides resistance and easy cleaning, in addition to lightness. Fewer glares. 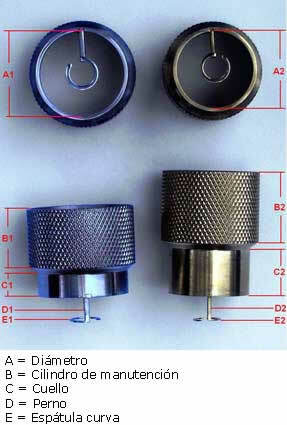 Its curved spatula implants rings with inner diameter (optical zone) down to 5 mm, opposed to the 4.4 mm of the old model.